We have taken a detailed look at the Tesla Model S EV, and provide you with details of our findings, from the battery and range to the style & design. Find a Tesla Model S for sale. The Tesla Model S is a model from Tesla which is an American Electric car Company. When Tesla came to the marketplace in 2012 with the model S they broke a lot of hearts. This was due to the model S being the first luxury executive fully electric powered car. With this car being the first of its kind it has also broken a lot of speculation around range-anxiety and the speed at which an electric car can go. The range on this car is up to 310 miles without having to stop. This is due to its advanced electric powertrain and its battery technology, which delivers the most exhilarating performance and drive unlike no other in its class. This new and exciting executive pure electric vehicle is unlike any gasoline internal combustion engine vehicle, this car doesn't have the hundreds of moving parts what as with others in its class. The Tesla Electric motors only have one moving piece which is the rotor. 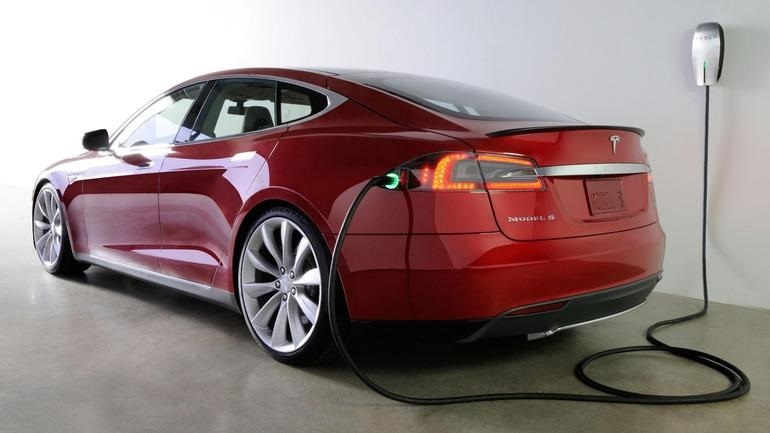 Due to this Technology the model S P85D has a stifling 0-62 mph in as little as 3.2 seconds. This for an executive car is as fast the Lamborghini Gallardo, yet with the comforts the Mercedes-Benz E class. Introducing Model S from Tesla Motors on Vimeo. How the Tesla Model S can be so fast and stick to the road, is due to its battery running under the undercarriage, this gives the car a great centre of gravity. This is also due to its Duel Motor that categorically improves the response and drive as the motors drive all four wheels. The Model S is digitally and independently in control of its rear wheels and its front wheels, the result is an unparalleled amount of traction control in all conditions. With this setup it then reaches the high-performance in which this car is famed for. This amazing pure electric car can achieve supercar status with its acceleration from 0 - 60 mph in 3.2 seconds. The battery options on this car are 60kWh which has a range of up to 240 miles and 0-62 in 5.9 seconds. Or you can opt for the upgraded option which is the P85D 85kw battery which can give you up to 300 miles without a single drop of electricity, and an acceleration which is an amazing 0-62 miles per hour in 3.2 seconds. As like all electric cars their as several options for charging, when using the Tesla type 2 connector you can expect to charge your new car up to 68 miles range per hour of charge. You will need a wall charger box for this which you can currently get discounted through the government incentives. If you were to not purchase one of these charger boxes and use a standard supply, then with just with a single charger it will take approximately one hour for 34 miles of charge. The average cost of electricity for this is on average £6.14p to travel up 135 miles with the charging time of 6.5 hours which is amazing for a supercar! When you purchase Tesla Model S with the 85 kw battery model and above, you can charge your car free for life at one of Tesla supercharger stations part of their charging network. These supercharger stations will charge your car up to 80% of its battery in only 30 minutes, that’s less time than it takes to have your breakfast when you are on the road. You will also benefit from Free WiFi and the ability to network with other Tesla owners. Autopilot is a project from Tesla that combines a forward-looking camera, radar and 360° sonar sensors with the real time traffic updates which in hand then, automatically drive the model S on the open road. This function can be used in the densest of road traffic, when changing lanes and for many other features. Also this feature already built into the car, it will detect a parking spot and for those who are nervous parking it will automatically park itself. This is all the standard equipment and safety features that continuously advance modern monitoring. It also features Science traffic signals and also makes you aware of pedestrians nearby, and it makes you and the car aware of your surroundings. The car warns you when you are emerging into an occupied lane on the motorway, or when you are approaching a stopped car too quickly. Due to this being a new feature there is a few new software upgrades that you can have, these are available as an add-on and include, traffic-aware cruise control, forward collision warning and camera enabled automatic high and low beam headlights. Because this software is so up-to-date, it gives you the peace of mind that you and your family’s lives are safe inside the Tesla model S. As a result of all these safety features this car has an approved euro N-CAP 5-star safety rating. Find a Tesla Model S for sale here.